An enterprising eBay seller has produced a few Vampirella based window decorations. I have one of these and it is rather good. I assume that these are home made and not mass produced, and the seller has done a good job. Translucent it works quite well, and worth laying out a shekel or two to brighten up your room. 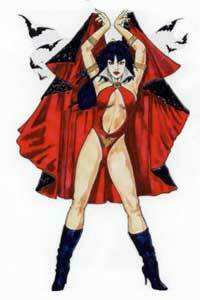 The images seem to be based on "fan art" as opposed to artists who have featured in the various Vampirella publications. I recognise the first piece of art as being by Lorenzo Di Mauro, but haven't placed the others yet ... though they are disturbingly familiar!